Originally from western Pennsylvania, Jim left for the Navy at age 17 in 1962. Over the next 20 years he served in the Submarine Force aboard two diesel submarines, three nuclear fast attack submarines, and made eleven deterrent patrols on two different fleet ballistic missile submarines. Jim also was an instructor at Submarine School’s Advanced Engineering Training Department. After retiring from the Navy in 1982 he worked for 17 years as an engineering consultant in the area of submarine noise quieting and completed a bachelor’s degree at Eastern Connecticut State University. In 1997 he started a third career as an artist. Studying watercolor with noted artists Lou Bonamarte and Gerald Levey he learned the fundamentals of the craft. Bob Spring taught him the value of a looser style. He also studied figures with Christopher Zhang. Jim started exhibiting his work at the Mystic Art Association and Lyme Art Association in juried shows. His work is presently in many private and corporate collections. 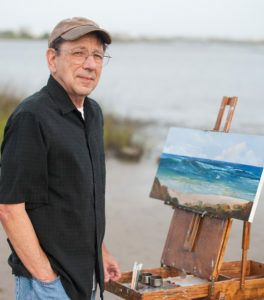 Jim’s work also includes being a senior historian for the Alligator Project (A Civil War submarine) and has generated artwork as a part of the project. Some of these have been published in prestigious journals. The originals of these works are the offices of NOAA’s Marine Sanctuaries Department and at museums such as the Independence Seaport Museum in Philadelphia. He recently was honored to become an Elected Artist of the Lyme Art Association (LAA), one of the nation’s oldest member run artist groups. The LAA was begun early in the last century by the group of Connecticut Impressionists who painted in and around Southeastern Connecticut. He is also a member of the United States Submarine Veterans and an active submarine historian and has written several books and numerous articles and papers on the subject of submarine technical history. Jim is also a member of the International Naval Research Organization and the American Society of Marine Artists. In 1968 Jim married Peggy Coan and together they raised a family that includes teachers, technicals experts, business managers and communications directors. Jim and Peggy have recently relocated to St Augustine, FL where they hope not to have to shovel snow any more.